Simulation and collision-avoidance for computer-controlled, multifunctional machining centers. With its multifunctional turning-boring-milling centers, WFL Millturn Technologies GmbH & Co KG has become one of the world’s leading suppliers in the field of complete machining. Besides crucial factors such as high quality, efficiency and reliability in the actual machine development, complementary professional and productivity-enhancing software products are increasingly important for this success. Through many years of constructive cooperation characterized by excellence, perseverance and confidence, two software products that have little competition in the international market have emerged so far: CrashGuard Studio and CrashGuard real-time collision prevention. The combination of an extensive, detailed and well-adapted offline simulation in the CAD / CAM area, as well as a high-performance, memory-optimized and integrated real-time simulation for collision prevention assists the customers of WFL Millturn Technologies GmbH & Co KG in using their multifunctional machining centers. In close cooperation with the RISC Software GmbH, software innovation in engineering has led to substantial improvement in resource efficiency and error prevention, in order to increase productivity and competitiveness and to reinforce market dominance. 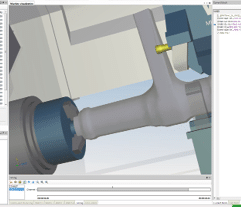 CrashGuard Studio is a 3D simulation software product for CNC multifunctional turning-boring-milling centers, which very realistically simulates the machine tools with their complex kinematics and extensive machining and processing options. An important milestone in the course of continuous development of CrashGuard Studio was the material removal simulation, which reached product maturity in the last development year. Analogous to the real machine, the ongoing removal of material can be viewed in real time in the 3D visualization. As a result, at the end of the material processing a 3D model of the finished part exists as an additional opportunity to verify the NC program. Product development and product maintenance are mainly carried out in cooperation with the RISC Software GmbH. A wide range of problems from the fields of geometry, algorithms, software architecture / software engineering has been solved by the RISC Software GmbH experts in order to meet the high demands of the product. The continuous improvement of the software and planned future enhancements underline the successful and trustful cooperation between the two partners. CrashGuard for Online Collision prevention, another product developed in cooperation between WFL Millturn Technologies GmbH & Co KG and RISC Software GmbH, is an extension of the controller unit that proactively detects and prevents collisions. This real-time collision prevention system embedded in the machine control aims to prevent collisions between machine parts of complete machining centers at all times and under all circumstances. To insure that the simulation model is always ahead of the current situation, the development of new computational methods adapted to the specific hardware resources of NC machine control was necessary. In particular, the highly optimized core application including algorithms and data structures as well as the corresponding preprocessing steps have been developed in close collaboration with mathematicians and computer scientists of the RISC Software GmbH in order to meet the enormous demands on the correctness and reliability of the system. Since 2005, the system has successfully been on the market and is offered as an optional feature for new machine tools. In the last several years most customers included this option in their orders, so that there are approximately 200 machines running the CrashGuard collision avoidance system today.